The Blackberry Bold is able to take beautiful pictures. This tutorial will describe the steps required to move pictures and videos between the Blackbery Bold and your mac using a USB cable. Out of the box, the Bold does not make it easy to transfer images and videos to and from your Blackberry and your Apple computer. However, with a couple of changes on your device, you can import and export the media without any problems. 7. Navigate to the pictures folder on the Blackberry to transfer pictures or the video folder to transfer videos. 8. 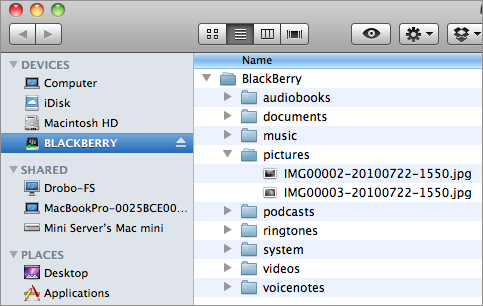 Drag the media from the Blackberry folder to a folder on your mac. You can also drag media onto your Blackberry through this method.